Patient centricity is a philosophical commitment to understand what matters to patients as a group – such as those with a specific condition – as well as being attentive to each patient’s experience with his or her disease and within a clinical trial. Companies that adopt a patient-centric approach have an immediate competitive advantage within the marketplace. Patient-centric programs value the patients’ viewpoints on what is being studied, what outcomes matter most in terms of daily living, or to what extent a patient would go to improve or expand treatment options. 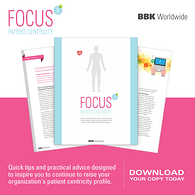 Focus 5 contains five short articles that target strategy & planning, patient advocacy, branding & advertising, prescreening patients and mHealth. Each one offers a unique look at how to apply the construct of patient centricity to engagement at-large. We hope you enjoy the content and that it inspires you to explore new tactics that enhance engagement. The sooner you start, the sooner you will raise your company’s profile in a positive way.